I almost thought I'd miss baking this one.Had planned to bake this as soon as we reached back from our holiday since I thought new baking tools and a new mixer might make me very excited when it came to baking something new,especially for WKtB.That was not to be,however.I went into a fortnight-long slumber without baking anything and I even started questioning myself whether I would update my blog anytime soon. I got myself a Breville Stand mixer and was wondering what to bake first to inaugurate it.Finally baked a batch of Vanilla cupcakes and guess what,there's no stopping me ever since.Baked Death by Chocolate and Brownies for a friend's niece and then some Jam rolls for a friend's daughter and then slowly the blog saw new updates,I'm relieved! Making doughnuts have never been on my list.We are not quite the doughnut loving crowd.I'd avoid it thinking I can accumulate calories in other stuff,why waste those on doughnuts;).But when Aparna sets forth a challenge,it has to be baked.Wait,is it a recipe for doughnuts which do not require frying and eggless,that had me motivated to bake a batch. Given a choice,I thought I'd go for the Chocolate dougnuts,but I was mistaken.The Cinnamon sugar ones had me eating one after the another.Thankfully,I'd baked those in small heart shaped sizes,which took care of the guilt part.Those were really delicious and I think would make for a perfect snack. make sure the dough is 1/2' thick before cutting out the doughnuts. make sure the doughnuts do not lose their shape when you transfer them from your work surface to the baking sheet or else you will end up with wonky shaped ones. make sure that whatever you use to cut your doughnuts is sharp so that it makes it easy to lift them off the work space without much difficulty. 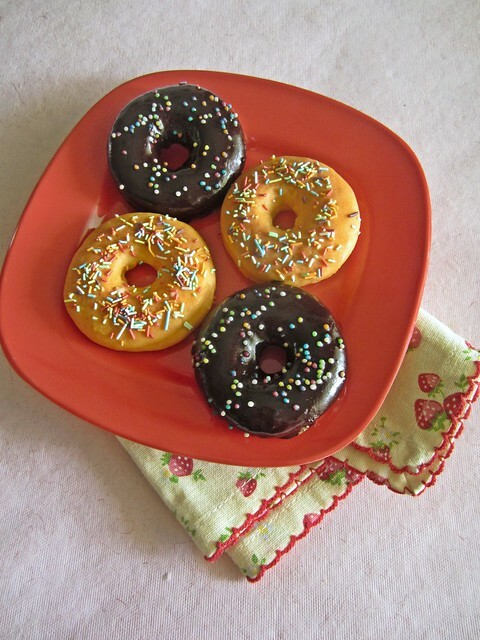 make sure you do not use a twisting motion while you cut the doughnuts which would not make them rise properly. Using a processor to knead helps but you can do this by hand. Put the sugar, milk, yeast, salt and vanilla in the processor bowl and pulse to mix well. Add the cake flour and 1 cup of all-purpose flour and process, adding a little more of the flour as necessary till the dough is thick and pulls away from the sides of the bowl. Now add the butter pieces one at a time and process till there no large chunks of butter are left in the bottom of the bowl. Now add a little more flour until your have a soft, pliable and elastic dough that is most but not overly sticky. 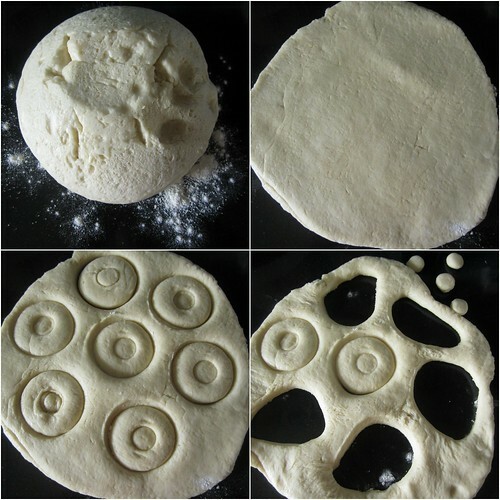 Turn the dough out onto a floured surface and knead gently until the dough no longer sticks to your hands. 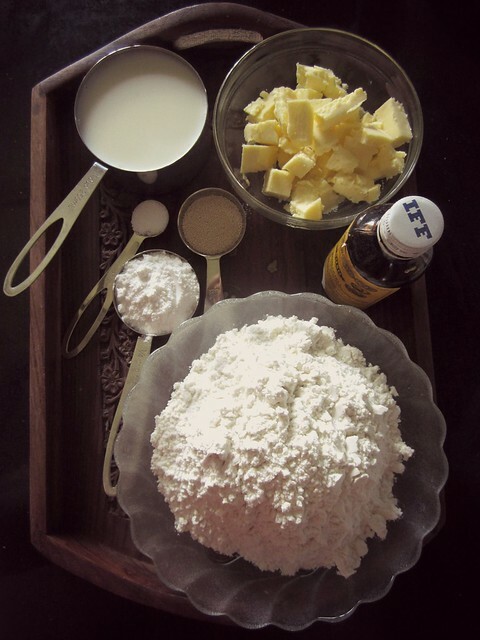 Shape the dough into a ball and place in a lightly greased large mixing bowl., turning it to coat well. Cover with a damp towel and let it rise till double in volume. This should take about an hour. Punch down the dough and roll out to a thickness of 1/2" thickness. 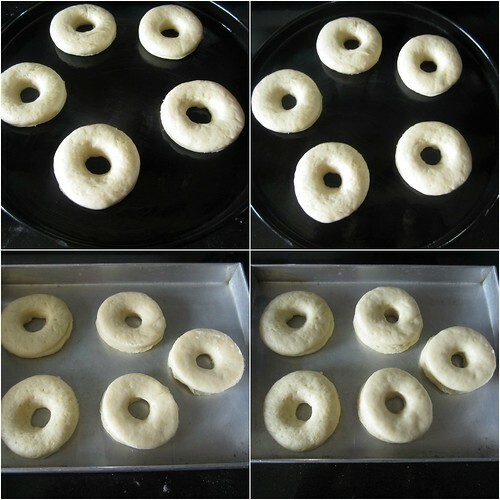 Cut out doughnuts using a doughnut cutter or whatever you have on hand to cut out 3” diameter with 1” diameter holes. If you’re making doughnuts to fill with jam, then do not cut out the holes. 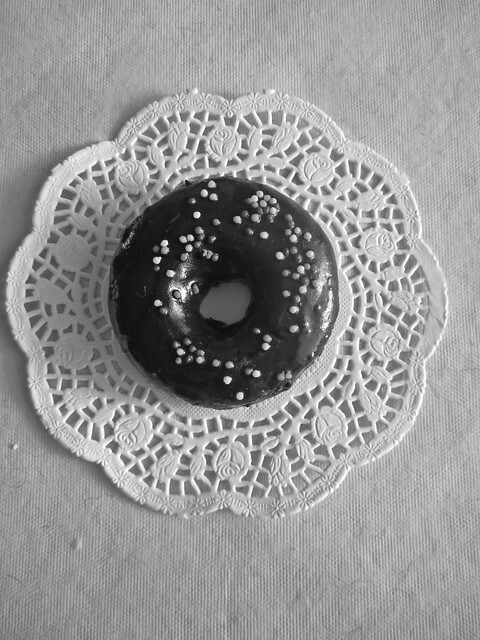 Place the doughnuts and the holes on parchment lined or lightly greased baking sheets, leaving at least 1” space between them. 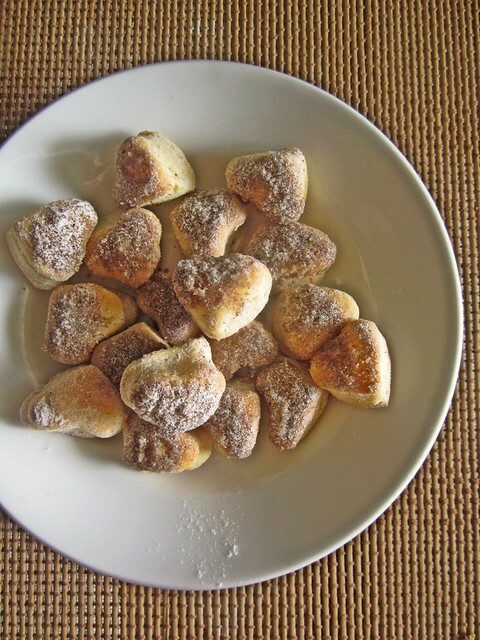 I did not bake the 'holes' as such.Re-rolled those and made heart shaped small ones which I later dipped in cinnamon sugar. Re-roll the scraps and cut out more doughnuts. Let them rise for about 20 minutes or till almost double in size and then bake them at 200C (400F) for about 5 to 10 minutes till they’re done and golden brown. Do not over bake them. 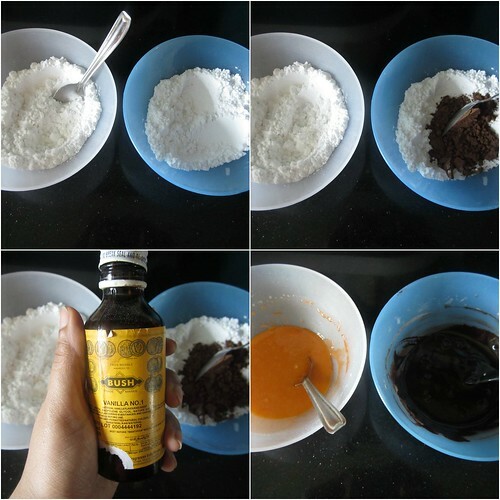 For the glaze,mix together all the ingredients mentioned,choosing your flavor-vanilla or chocolate.I made two batches of each and added a pinch of food colour to the vanilla glaze. This recipe makes about 12 to 14 doughnuts and holes. Take them out of the oven and immediately brush them with the melted butter and then dip them into the cinnamon sugar mixture. If filling the doughnuts with jam, let them cool. Put the jam into a piping bag with a writing nozzle/ tip and press into the doughnut from the side and gently press out the jam into the doughnut till it starts oozing out. Jam doughnuts do not need too much jam to fill them. If glazing your doughnuts, let them cool completely and then dip one side of the doughnut in the glaze of your choice and let it set. OMG they look just like krsipy kreme doughnuts...my 5 year old dotty loves original glazed and chocolate glazed ones from krispy kreme but now i don think i ll hav to spend so much on them thnks to u n thnks for the recipe...but one doubt, u hav not mentioned how to prepare that glaze....and also can i use my stand mixer with padle attachment to make d dough instead of d processor?? I have updated the post with the glaze recipe.You can use the paddle attachment or even knead the dough with your hand. those doughnuts look super cool..i wish i can grab one.. I tasted only once doughnuts, it was in a BF buffet, not sure it was the best I had, but sure yours looks perfectly done and tempting! Lovely, I guess it is going into my MUST TRY list.. Thanks a ton for the recipe. Bookmarked. Thanks for sharing. 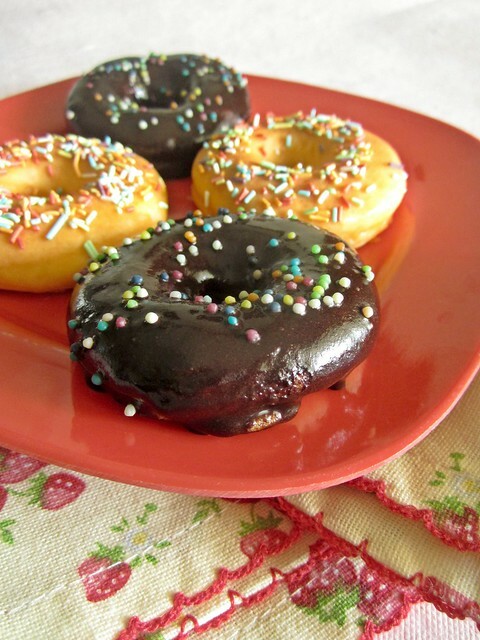 I'll try soon..
Donuts look so delicious and I must try preparing them very soon. G'day! These look lovely, true! Is only brekkie, but would love one right now too! Eggless is a bonus for me ..well done! curious where you ordered the stand mixer from? also, pls consider posting a review of it after you've used it for a while. thanks! That chocolate glaze looks absolutely sinful! Yumm! Congratulations on the Breville... a stand mixture really is a great buy! These doughnuts look delicious, can't believe you made homemade doughnuts though! I don't have an oven can't I bake the doughnuts in a microwave? Can I make them a day ahead? Sure,just reheat in a microwave for 10 seconds and serve!